I got my U.S. Census form in the mail yesterday. They're SERIOUS. Very intimidating language on the envelope: U.S. Census Form Enclosed. YOUR RESPONSE IS REQUIRED BY LAW. Who do they think they are with the All Caps? ME? So I was going to sit down and complete it last night, because one, who doesn't love a survey? And two, apparently my response IS REQUIRED BY LAW. But then I was late getting home from work and baseball team mom errands, and I really didn't want to waste time I could be spending with the boys doing The Census That's Required By Law, so instead I just settled in to watch them play. And by "play," I mean "watch them laze around on the couch while watching TV and burning all those calories they ate at supper." But seriously. Look at the placement of that TiVo remote. Nick is a man after my own heart ... it has become one with his body. If I haven't mentioned it much since we got it, we are LOVING the new sectional. Yes, it's huge and brown, and I know huge and brown aren't for everyone, but MAN is this couch working for us. The entire family of five plus Scout can sit on the couch comfortably and watch a movie. Or two of us can lay on it and not take up a full side. Yet. I know the day is coming when two of the boys laying head to foot will take up the entire couch in all directions, but we're not quite there. We're still at the stage where they're small enough to dig their feet in and raise their rumps in the air without causing any major stress on the couch. Of course, the couch IS feeling the weight of its massive responsibility in the "absorbing saliva" category. Every night there are about five to 10 drool spots (like the one behind Jake in this picture) from end to end on the couch. It's also met its match in the "cat fur" category with Scout having staked out his favorite spot on the far left cushion. He sits there with us every night and sometimes spends the entire night there while we're snug in our beds. The couch has developed a Scout-shaped depression right there. That's really no surprise since you can kind of tell from this picture (when he was on the move) that he's roughly Jake's size. As usual, last night when I had my little camera out, Jake wanted to get his out, too. He doesn't quite have the correct form down yet. As I've established in the past, all of the pictures he takes come complete with his fingers in them. And when it was finally time for them to head up to bed, I thought to myself, "NOW would be an excellent time to comply with The Law." And then I chose to blog instead. So if The Law comes to get me because my Census Form was late, I'm going to refer them to you. The federal officers can entertain my children while I finish this post. You just got a snapshot of your living room instead of a snapshot of america ( i think that is their slogan this year) you followed half the instructions. I think your snapshot is cuter then the one of the whole country anyway! Lol. We got our form too. My husband got out his trusty copy of the Constitution and he's going to fill it out Constitutionally. Hehe. I'm kinda glad cause as far as I'm concerned I really don't want them to know how much money we don't make. 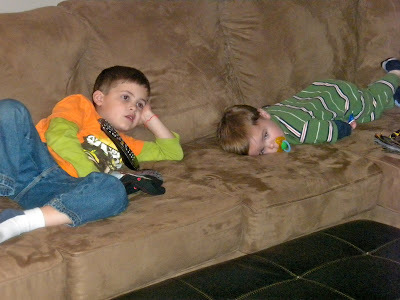 :) You're boys are too cute and I would have spent the evening watching them too. Loving this post! But I have one question: Is that a cat or a mountain line because man alive, that is a big cat! On second glance, perhaps it's more of a shadow that I'm seeing, but I still think it's a big cat. And did you love your preview letter that was sent about a week ago that said something like, "The census is coming! In one week! Be on the lookout!" I think that's the biggest cat I've ever seen! How funny! Love the sectional. It looks comfy. Enjoy the frappe...you'll love it! Ours is ready to mail. I told hubby that we can't die before April 1st. Did you notice that there is space for TWELVE residents in one household? What will the Duggers do? It also became very clear that the government is really more interested in counting us if we are Latino. They must be special. There's not a block for me to mark: Scot, Swiss & French! Paige, you are so right. PRIORITIES.